Procuring qualitative data for your marketing campaigns is a tough task where Blue Mail Media can play an instrumental role. If you are looking for networking opportunities in Virginia, our mailing list will help you interact with your target audience and expand your scope of marketing. We have a huge repository of records of industries, business enterprises, decision makers, C-Level executives, and professionals in Virginia. Whether you wish to connect with your target prospects via telephone, email or mail, our email list will provide you with comprehensive information to meet the purpose. Blue Mail Media offers immense flexibility to its clients and offer data customization services to help them equip their sales and marketing cadre with data that meets their campaign specific requirements. Our Virginia Executives Email Database perfectly aligns with your marketing goals and gives you enough opportunities to engage with your potential market. Your sales operations are as good as the database used by you. Our list is perfectly designed to boost your campaign response rate, conversations and eventually positively impact your RoI. 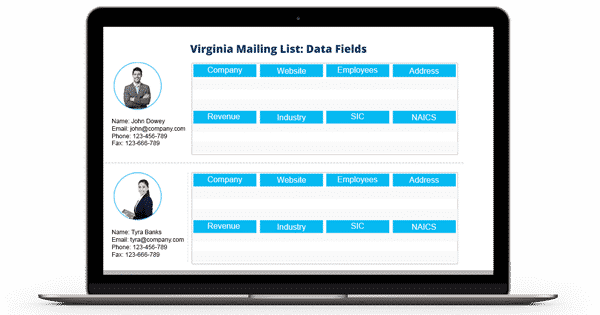 Marketers can get their Virginia Business Executives Email Database customized as per multiple selects such as Business Name, SIC/ NAICS code, Scale of Operations, job Role, Employee strength, among many others selects. Blue Mail Media has a well-established presence across multiple regions and can offer you qualitative data without any time and place constraints.